Way back at the start of 2010, we applied for funding through Community Energy Scotland for a wind turbine. A number of months on, with planning permission and grid connection in place, we installed a wind-turbine, ready for winter. We need heat for the staff and a fair bit of lighting in the depths of winter, at the Urgha Community Recycling Site. From November 2010, we have been generating our own electricity from the turbine now sited at the rear of the adjacent coal yard. The Tarbert Grazings Committee have thankfully given us their approval. We selected a Westwind 10kw machine on a 12.5m tower for the site. This generates enough electricity to meet the needs of the site, and help with the long-term sustainability of the operation -through the export of surplus energy. Following the Urgha installation, we have worked with the Trading arm of Community Energy Scotland to find other good sites for small scale generation. 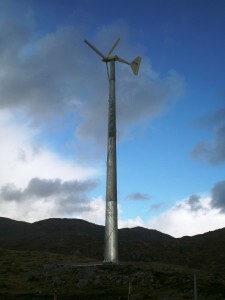 In December 2011 we commissioned two Britwind/Evance 5kW turbines at Scaladale. 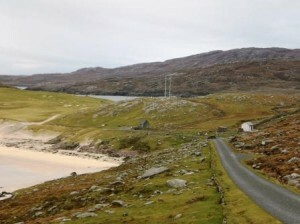 These turbines feed electricity into the Lewis and Harris Youth Clubs Association building. This registered charity is now benefiting from reduced fuel costs and a much lower carbon footprint.You can just make out the two sticks in the picture behind the main building. In November 2012 we installed machines in West Tarbert. Planning Permission was granted for three 5kW turbines on land behind the old primary school. We were working with the council to reduce fuel costs in the school and the Croileagan building. 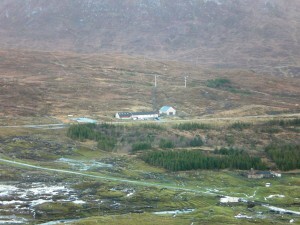 By the time all the permissions were in place, both these buildings were empty, so the turbines have been connected to three social housing units. 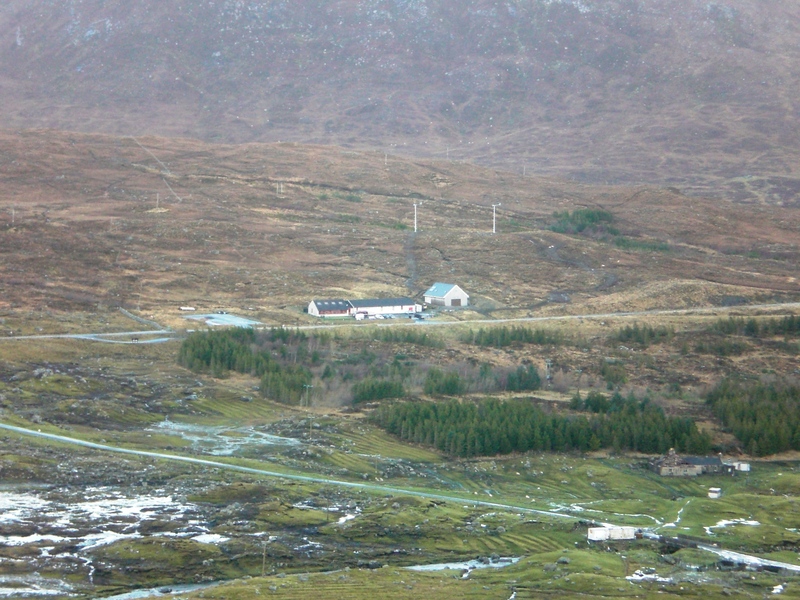 The machines are owned by Community Energy Scotland Trading who have contracted with Hebridean Housing Partnership. Three local residents will benefit from reduced heating bills, whilst the Trust gains a small rent for the siting of turbines on its land. 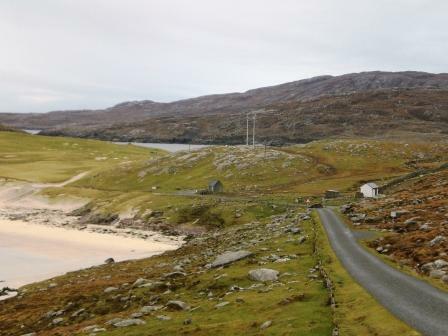 With the Isle of Scalpay coming under the management of the North Harris Trust, we started to explore the possibility of installing a wind turbine on the island. As part of the Feasibility Study undertaken prior to the transfer to community ownership, two sites were identified. The Trust secured planning permission for a 50kW machine on the “Hyperfix” site on the common grazings past Outend. Despite the good wind resource, the high grid connection cost meant that the project would not be viable for the Trust. A commercial developer however showed interest in the site. 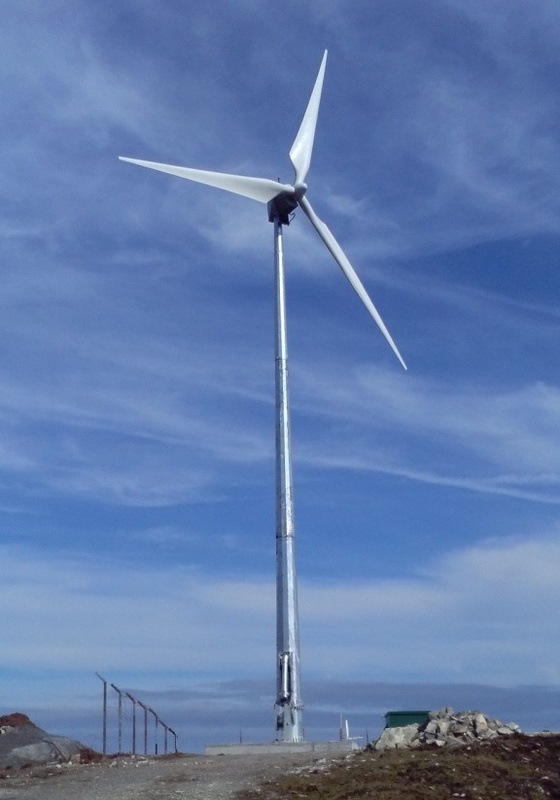 A 50kW Orenda Skye wind turbine was installed on the site in the summer of 2016. The Trust will receive ground rent for the site. The local grazings committee has benefited from road widening and surface improvements. The Trust had been working on a multi-turbine project at Monan for over 10 years. Planning permission was secured along with grid connection in 2009. We struggled to get a European turbine manufacturer interested in the site because of the high levels of turbulence. Despite the good open aspect to the south west, the hills surrounding the site interfere in certain directions, stiring up the wind. 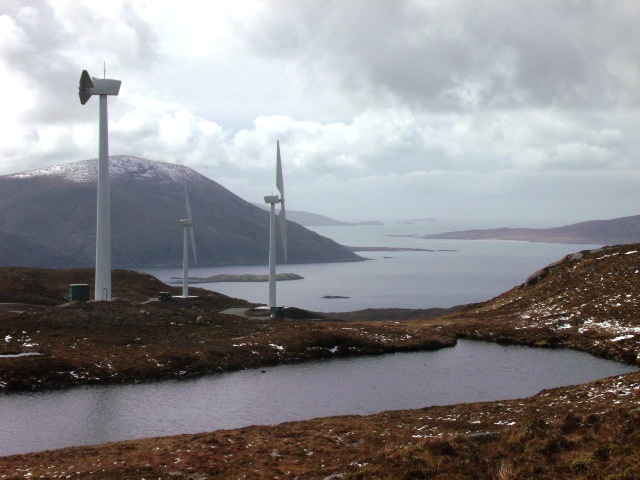 In January 2014, the Monan Wind Company was established as a joint venture between the Trust and Windflow Technology Ltd to progress the development on the Monan hill near Ardhasaig. Windflow have a unique two-bladed design that can work in the high turbulence caused by North Harris’ big hills. Work started on site in the summer of 2014. In spring 2015, the last of three machines was commissioned. There are now three Windflow 500kW turbines operational on the site. the Trust has a minority shareholding.